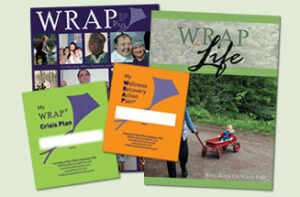 The Plus Life Bundle has WRAP Plus, WRAP for Life, My WRAP and My WRAP Crisis – all in one convenient bundle. If you bought the items individually they would cost $48.90 we bundle it together for $44.00. Buy the bundle and save! WRAP for Life can serve as your day-to-day guide for working on personal issues like raising your self-esteem and self-confidence, developing a strong support system, enhancing your relationships with family members and friends, making new friends, learning to be more assertive, increasing your career or vocational competencies, and enriching your life. It is used to help address issues related to “whole” health. WRAP WORKS!